The question "Are you listening?" 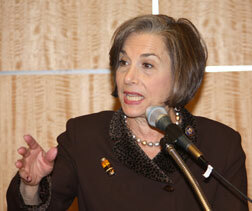 became the battle cry for the 2010 NFB Washington Seminar, our annual midwinter legislative event. Emblazoned on the NFB in D.C. buttons that members wore while visiting congressional offices, this slogan helped identify us as a group with a distinct legislative agenda for the second session of the 111th Congress. Fourteen members of the NFB national board of directors, thirty-seven state presidents, forty-nine affiliate delegations, and well over five hundred Federationists filled the Columbia and Discovery ballrooms of the Holiday Inn Capitol--our traditional headquarters hotel--for the great gathering-in on Monday evening, February 1. The crowd was inspired and motivated throughout the week by a series of announcements and an award presentation made by President Maurer that reflected the continuing influence of our organization. A leadership seminar for the 2009 NFB scholarship winners and their student mentors took place at the National Center on Saturday, January 30, and the students then traveled to the Holiday Inn Sunday morning in time to participate in the National Association of Blind Students' midwinter conference. 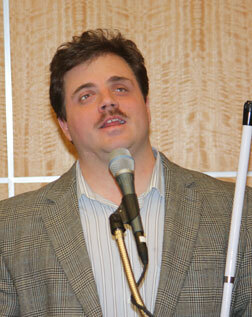 The National Association of Blind Students conducted its annual conference most of Sunday at the Holiday Inn. On Monday morning the National Association of Blind Students held its first-ever information fair, where different educational and technological vendors and speakers from the previous day's seminar presented their products and services at booths set up around the perimeter of the Discovery Ballroom. The National Organization of Parents of Blind Children conducted an intensive two-day leadership seminar for parents committed to organizing or strengthening their state parent divisions. 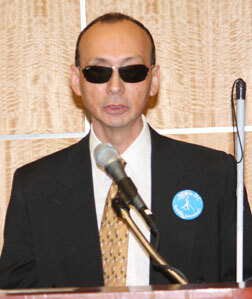 The National Association of Blind Merchants conducted a Monday seminar for its members. Demonstrations of the existing interface for the blind-drivable vehicle were offered on Monday afternoon to promote the Race for Independence campaign for the Imagination Fund. The newest features of the knfbReader Mobile were demonstrated at various times and locations throughout the Washington Seminar. The NFB research and development committee met at the National Center on Saturday evening, Sunday, and Monday. About fifty Federationists traveled from Washington to Baltimore for a tour of the National Center and to shop at our Independence Market. The Governmental Affairs and Affiliate Action Departments collaborated to present the 2010 legislative seminar, including advice on mastering Capitol Hill protocol, learning the facts of the legislative agenda, and making effective presentations to members of Congress and their staffs. During the great gathering-in President Maurer reviewed a series of meetings he has conducted with highly-placed officials in the Obama administration to promote the policies and views of the NFB. He announced that earlier on Monday morning, February 1, he and other Federation leaders had met with United States Secretary of Education Arne Duncan to present the book, Let Freedom Ring: Braille Letters to President Barack Obama, a volume containing one hundred first-person accounts of the effect that Braille--or its absence --has had in the lives of the writers. Further details of this book presentation, the culminating event in our 2009 Braille Readers are Leaders (BRL) campaign celebrating the two hundredth anniversary of the birth of Louis Braille, appear elsewhere in this issue. President Maurer told the assembly that several weeks ago he met with U.S. Secretary of Transportation Ray LaHood to familiarize him with our concerns about silent vehicles and to encourage his support of the Pedestrian Safety Enhancement Act of 2009. 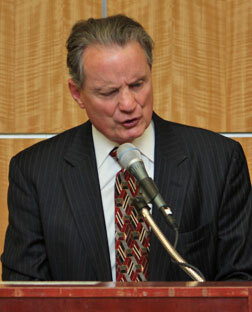 He also announced that he had met with U.S. Attorney General Eric H. Holder Jr. to discuss issues of civil rights for the blind, and he reported that Assistant Attorney General for Civil Rights Tom Perez has agreed to be a keynote speaker at the tenBroek Law Symposium scheduled for later this spring at the National Federation of the Blind Jernigan Institute. President Maurer said that, only weeks before, he had addressed the staff of the Library of Congress, the largest library in the world. It is committed to creating one of the largest digital book collections anywhere. He urged the importance of making this digital book collection nonvisually accessible. He also told Federationists that he would soon be delivering a lecture on the rights of the disabled to participate fully in society at a symposium at the Yale University School of Law. Consistent with our quest to secure equal access for blind people, President Maurer described our recent settlement with Arizona State University to refrain from using inaccessible digital teaching technology like the Kindle DX. He also told us that at our urging the U.S. Department of Justice had reached similar agreements with several private colleges and universities who had tried to introduce inaccessible technology as an instructional method in their mainstream courses. Finally, he announced that NFB of Colorado President and attorney Scott LaBarre is in the process of serving notice to all three hundred law schools in the nation that they could be added as a party to our lawsuit against the Law School Admissions Council if they fail to work with us to address the access challenges that blind law school candidates face today. On a brighter note Scott LaBarre reported a positive ruling that a Federal District Court judge recently issued in which the National Conference of Bar Examiners has been directed to allow Stephanie Enyart, a blind graduate of the UCLA law school, to take the multistate portion of the California Bar Examination and the Multistate Professional Responsibility Examination using the access technology with which she is most familiar. While the preliminary ruling in this case applies only to Ms. Enyart, most observers agree that this decision bodes well for the access concerns of blind candidates throughout the country who sit for bar examinations that use these national tests. 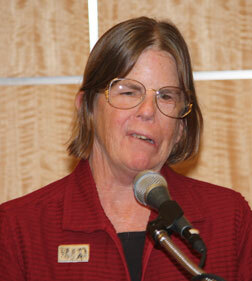 Other Federation leaders kept activists informed of recent organizational successes and developments. NFB First Vice President Fredric Schroeder told everyone that we had sold two hundred and twenty thousand Louis Braille Bicentennial Silver Dollars in 2009, and he announced that, once matching funds were raised, the United States Mint would be giving the Federation approximately 2.2 million dollars to promote the programs of our BRL campaign. Imagination Fund Chairman and NFB of South Carolina President Parnell Diggs introduced Washington Seminar participants to the 2010 Race for Independence, a campaign dedicated to promoting accessible technology for blind people. Read more about the Race for Independence elsewhere in this issue. James Gashel, vice president for business development with knfbReading Technologies, updated Federationists on recent developments with the knfbReader Mobile. He told the gathering that since last year the company had added support for eighteen foreign languages and had expanded support of the technology from two to eight phone models. Jim reported that Michael Hingson, director of the NFB direct sales initiative for the knfbReader Mobile, is the leading distributor of the technology in the nation, with eleven cooperating dealers around the country. This year knfbReading Technologies focused mostly on promoting its exciting new product, the Blio, a free and accessible piece of book-reading software that will soon be launched. According to Jim, the Blio will allow blind users to access over one million titles, a vast body of material previously unavailable to our community. He reported that this software will run on notebook computers, netbooks, and general computers and in time on a variety of other platforms. Those using the Blio software will be able to buy commercially available books using this system. Federationists were invited to visit <http://www.blioreader.com> for further information about this innovative product. News of interest to members from the NFB national office was released during this Washington Seminar. President Maurer announced that as of Monday afternoon, February 1, NFB-NEWSLINE® would feature two new, more human-sounding voices for those who continue to read newspapers and magazines over the telephone. Call NFB-NEWSLINE to give Paul and Kate a listen. Additionally, subscribers can now have the text of specific articles sent directly to their email addresses while listening on the telephone by pressing pound and then the nine key while reading any article. Mark Riccobono, executive director of the NFB Jernigan Institute, announced that the Braille Enrichment for Literacy and Nonvisual Learning (BELL) program would be expanded this summer to our Virginia, Texas, and Utah affiliates. He also said that the summer of 2010 would see two sessions of the Jernigan Institute’s Junior Science Academy for elementary-age students interested in learning about science, technology, engineering, and math. As the great gathering-in drew to a climax, President Maurer introduced the recently confirmed commissioner of the Rehabilitation Services Administration (RSA), Lynnae Ruttledge. 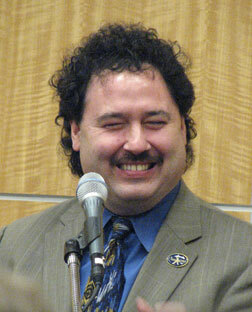 Commissioner Ruttledge warmly greeted the gathering, referring to the NFB's international reputation. She promised to make herself available to our leadership for policy conversations, and for the first time in a number of years, we have cause for optimism about the working relationship between the NFB and RSA. John Paré, NFB executive director for strategic initiatives, along with Jesse Hartle and newly hired Lauren McLarney, NFB government program specialists, then briefed the audience on our three legislative priorities for this year: promoting H.R. 734 and S. 841, the Pedestrian Safety Enhancement Act of 2009; advancing H.R. 886 and S. 2962, our Social Security Disability Insurance legislation; and introducing H.R. 4533, the Technology Bill of Rights for the Blind, new legislation to create--through study and ultimate regulation--accessibility to a variety of home appliances and mainstream products that are currently not usable independently by blind people. Our legislative memorandum and fact sheets, providing more detail on these initiatives, are printed elsewhere in this issue. Since S. 2962 and H.R. 4533 had been introduced only days before the Washington Seminar convened, these bill numbers are not in these documents. Deviating slightly from our standard practice, President Maurer returned to Washington, D.C., for the Wednesday evening briefing to introduce two members of Congress. He first presented to the enthusiastic crowd Illinois Representative Jan Schakowski, the original sponsor of H.R. 4533, our new Technology Bill of Rights for the Blind. 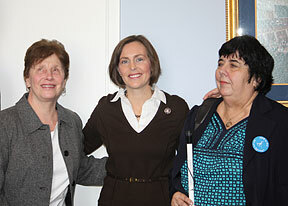 The Congresswoman spoke sincerely about her support for our commonsense initiative, and she promised to do everything in her power to champion our cause for access to basic technology that everyone but the blind already fully enjoys. 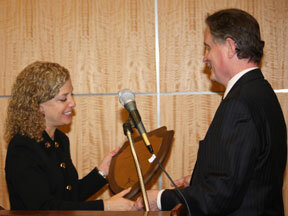 President Maurer then introduced Florida Representative Debbie Wasserman Schultz, chairwoman of the Subcommittee on the Legislative Branch of the Appropriations Committee. She was presented with an NFB Distinguished Legislative Service award in recognition of her valiant effort to secure full funding for the National Library Service for the Blind and Physically Handicapped (NLS) digital book conversion program. President Maurer explained just how vital this program is to blind readers in America. Representative Wasserman Schultz graciously accepted this award and commented on the potency of our grassroots skill as an organization. The final briefing of the Washington Seminar was truly one in which two powerful members of Congress--both deputy whips for the majority party--had a chance to hear our voices. Federationists blanketed Capitol Hill on Tuesday, Wednesday, and Thursday to discuss our legislative priorities with every member of the House and Senate and their staffs. Now that we have returned home from Washington, the hard work begins. 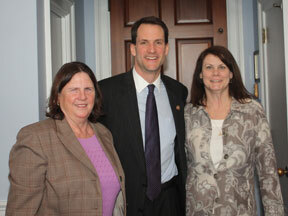 We must follow up with the staffers responsible for the issues we discussed. We must urge that our U.S. representatives cosponsor H.R. 734, H.R. 886, and H.R. 4533. We must similarly insist that our U.S. senators support S. 841 and S. 2962 as well as the Technology Bill of Rights for the Blind as soon as it is introduced. We must remain at the ready at a moment's notice to follow any instructions our national legislative staff gives us so that the collective power of the NFB can continue to influence public policy for blind people in America. We must not let the momentum started at the 2010 Washington Seminar subside. Our work has just begun.